How do you get noticed at a Rick Springfield concert? 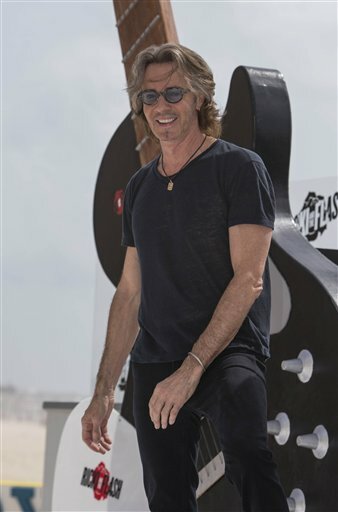 If the first scenario of Rick Springfield finding my blog and seeking me out at the March 7 concert doesn’t happen (see here for # 1 possible scenario of meeting RS) – and I do admit that it’s highly unlikely to work out that way – I need some other ideas. Since all-knowing Google always seems to find some answers, I decided to search there for guidance. Here’s what I found. 2. Scream loudly when there’s silence: I could do that. If I bring my 4-year-old along, he could definitely do that and that would take care of two of these suggestions. 3. Carry an embarrassing banner: The article suggested holding signs with ludicrous statements such as “I’m pregnant with your child” on it. My husband has been very understanding with my recent RS obsession but I think that might be going over the line. 4. Dress in an outrageous outfit: The article suggests a comical costume or a stage outfit like those previously worn by the focus of affection. How about a Comic Book Hero costume? Or a pink suit from the early 80s? Or I could forgo the outfit and go for the famous Zoot “suit,” (and I’m not talking about the pink one) but that would probably get me arrested and I’d miss the show. 5. If all else fails, burst into tears: I’m not sure how effective that would be from Row 30. 6. Dress up like a fruit or vegetable: Apparently, that’s what a member from the band 5 Seconds Of Summer (whom I never heard of before this Google search but they opened before One Direction’s tour earlier this year. Actually don’t really know much about One Direction either but I have heard of them. Am I showing my age here?) Anyway, yes, that was what one of the band members suggested. So there you go, these are some of my options. Maybe I’ll just hope that he finds this blog. Hey Rick, I’m in Row 30! So, as I’ve mentioned earlier, I have tickets to see RS in concert on March 7. I’ve already come up with one possible scenario for meeting him, one that uses the marvels of modern technology. This plan depends on RS following my blog and reading my posts about my 30 years of admiration for him. That way when I meet him, he’ll already know how I feel so when I’m standing there with a silly grin and can’t think of what to say, I wouldn’t have wasted the moment. Since the concert is in a festival format, he’ll likely be there early and he’ll know I’m in Row 30 and come find me because he was just so impressed by the blog. I’m not really sure where to go from there. If it was 30 years ago, it would be easy: “We’d get married and live happily ever after.” But being that we’re both already married, that wouldn’t work. So I’ll just merge it with another dream, one of recording a CD of my own songs. Yes, let’s go with that. So, we have an instant connection and we decide to record an album together. Or, if that doesn’t work, maybe I’ll just bring a card with my blog address on it in case I get a chance to meet him and hand him the card since I probably will just stand there with a silly grin on my face. As I mentioned earlier, I’ve been going through many of my journals and its been quite an adventure going back in time and learning about my younger self. I did a lot of writing! I have notebooks filled with different songs that I wrote, dating back to 1984, and I can still remember the tunes to many of them. I can even remember the inspiration for some of them. Some of the earlier ones were inspired by plot lines from “Twilight Zone” episodes, but they got more personal as time went on. I also realized that I’ve dated many musicians or wanna-be rock stars. Perhaps that factor was also influenced by RS? But last night I came across a HUGE surprise on my journey, tucked in folders of high school essays and college transcripts: Two savings bonds. One was from the year I was born and the other from 1982. I went to cash them in today – several bills are due so very grateful – and they totaled over $300! Pretty amazing. I didn’t even remember that I owned any savings bonds so I’m taking that as a sign from G-d that whatever I’m doing going through my old journals and wanting to do more with them is the right path. Found these pictures in an envelope with my old journals. 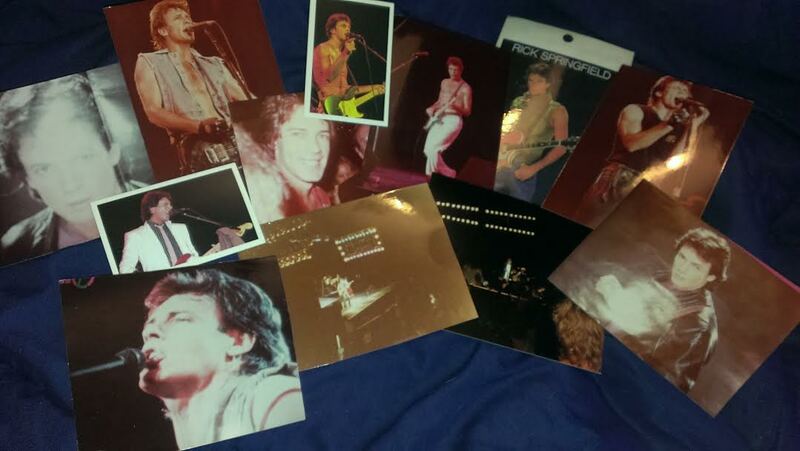 The photographs in bottom center are from two of his concerts (not great seats, obviously). I think at least one of those photos was taken with a Kodak disc camera. More times than I remembered! I’ve been going through my old journals the past few days and somehow Rick Springfield’s name keeps popping up where I didn’t expect it. Just random mentions here and there and I’ve realized I’ve seen him in concert more than I originally thought! Here’s what I’ve uncovered so far, pieced together from these journals. By 1985 (midway through high school) had seen him twice in Phoenix. So March will be my seventh show. I also didn’t realize how dark some of my writing was. I’m guessing it was because writing was a sort of therapy during difficult times but as I’m reading through all of these notebooks, I’m a little surprised at what I’m finding. Maybe I have something else more in common with RS than I thought. I’ve got Rick Springfield tickets! I have tickets to see Rick Springfield in concert, for the first time in 15 years! Well they’re not even really tickets anymore, I received an email and printed them out on a piece of a paper, but whatever, that’s not the point. I’m going to see Rick Springfield in concert! It’s not until March, so I have a few months to wait. A few months to think about what I’d say to him if I get to meet him. What would I say anyway? Is there even anything I could say that he likely hasn’t heard thousands of times from thousands of women? Ironically, the concert is on my mom’s birthday. She knew how I felt about Rick Springfield, maybe this is some kind of posthumous gift from her? If so, thank you, Mom. Oh, and I’m going to the show with my best friend from high school, who I’ve seen RS with four other times, including once in junior high and once in high school, so that makes it even cooler. Now I have just over three months to think about what I would say to him if I were to meet him. We took our sons to my Dad’s house for Halloween to hand out treats – he gets lots of kids in his neighborhood, plus it’s nostalgic for me since its the street I grew up on and went trick-or-treating on myself. So between the knocks on the door, I looked through old photo albums. One of them that I picked up had a couple of photos from my 14th birthday party. My mom had taken photos of me opening my presents and what did I get? A Rick Springfield T-shirt and a black and white photo of Rick Springfield.